Richardson Farm invited us to be their guest and tour the Richardson Corn Maze and Adventure Farm in Spring Grove, Illinois including the Richardson Farm World’s Largest Corn Maze, Zorbing and Zipline. Today “Where Are You Today?” takes you with us as we go zorbing in the zorbing ball or try out the human hamster ball. Previously we wrote about the corn maze and posted video of me riding the 700 foot zipline across the farm. Photo Courtesy: Richardson Adventure Farm, Spring Grove, McHenry County, Illinois. 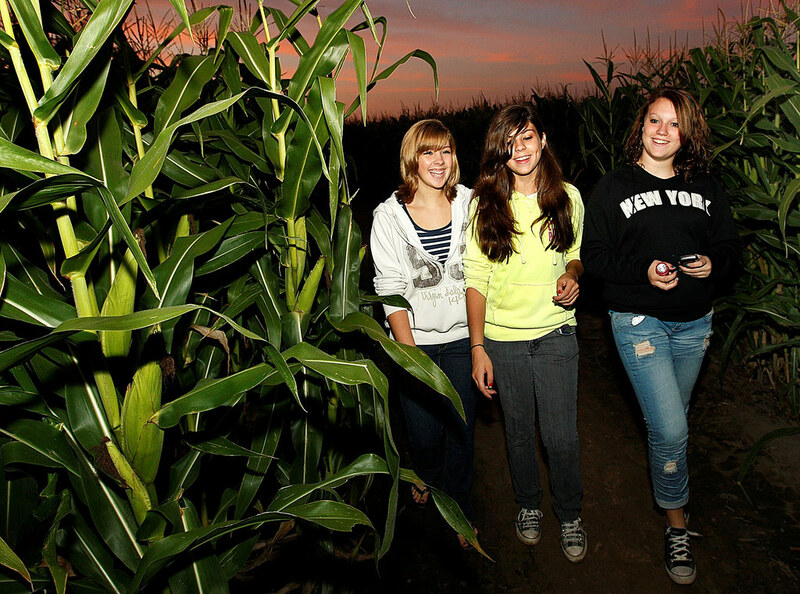 Candace H. Johnson - lcjedit@nwnewsgroup.com Kelsey Hoxie, 14, of Round Lake, Jenelle Nikolai, 14, of Round Lake Beach, and Lindsay Pendley, 14, of Spring Grove, walk through the Richardson “World’s Largest” Corn Maze at dusk in Spring Grove. Richardson Farm is the place for the ORB Ride also known as orbing, zorbing or sphereing in the Chicago Area. Climb the steps to the top of the launch ramp where the Certified zorbing operators strap you into an 11′ ball. They give the orb ball a push and send you plummeting down the hill! What a rush to experience the ride as the zorbing ball races down the ramp and bounces along a grassy patch. Spectators and the faint of heart have fun watching too. Are you brave enough to try out the zorbing ball? I was! Click on the image below to view this episode of “Where Are You Today?” and watch me take on the zorbing human hamster ball. You can find Richardson “World’s Largest” Corn Maze on Facebook and Twitter. Follow their updated for the latest weather reports from the farm, updates on special events and news. 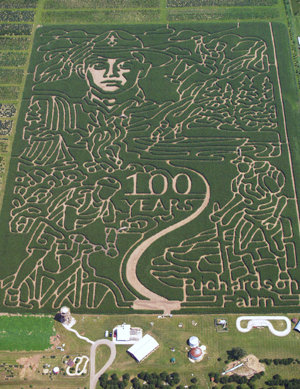 The Richardson Corn Maze and Adventure Farm is located at 9407 Richardson Road near Spring Grove, IL. in northern McHenry County. It is about one hour northwest of Chicago, one hour southwest of Milwaukee or 15 minutes south of Lake Geneva. For more information call 815-675-9729.